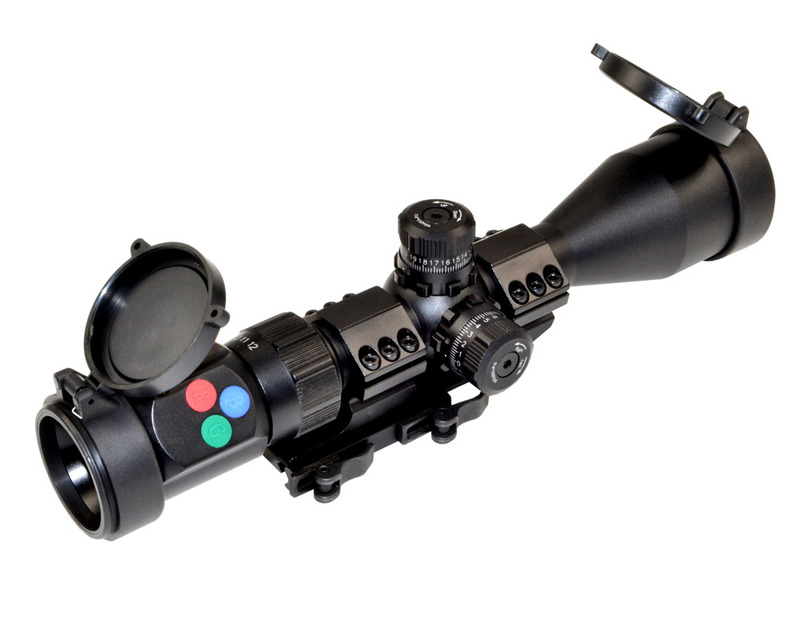 Presma® EX Professional Series 3-12X44 Precision Scope, RGB RXR Reticle. The Presma® EX Professional Riflescope is a versatile, variable powered riflescope equipped with tri-color electronic illuminated reticles. The easy to access and clickable color/brightness buttons are designated on a 45 degree of surface on the rear of scope. Selectable 11 brightness adjustment control lets the user adapt to different terrains and temperatures. Automated shut down power to conserve battery’s life and memorize the last reticle color and brightness position when the power is on. Mounted level bubble on the rear of tube provides tool of stability level. And comes with a bonus sunshade to block unwanted lights allowing user to see target with more clear result. Presma EX series riflescopes are CNC machined from one piece of 6061-T6 aluminum and hard anodized against corrosion with a black matte finish; Sealed O-ring and Argon filled for waterproof, fogproof and shock proof performance. This compact design makes easy maneuvering possible in real hunting and shooting activities. Featuring a high quality fully multi-coated lens, Presma® EX series Riflescope forms clear, bright and sharp sight image edge to edge. 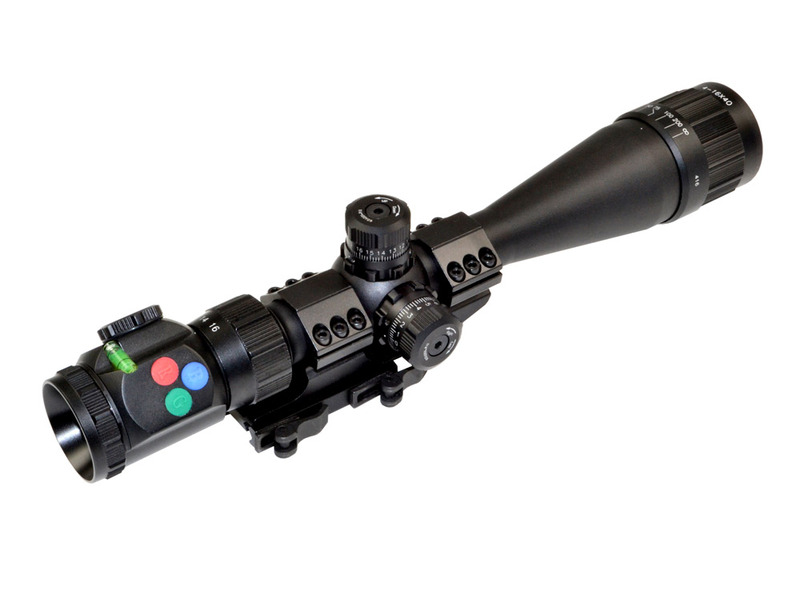 Presma® EX Professional Series 4-16X40 Precision Scope AO, RGB RXR Reticle The Presma® EX Professional Riflescope is a versatile, variable powered riflescope equipped with tri-color electronic illuminated reticles. The easy to access and clickable color/brightness buttons are designated on a 45 degree of surface on the rear of scope. Selectable 11 brightness adjustment control lets the user adapt to different terrains and temperatures. Automated shut down power to conserve battery’s life and memorize the last reticle color and brightness position when the power is on. Mounted level bubble on the rear of tube provides tool of stability level. And comes with a bonus sunshade to block unwanted lights allowing user to see target with more clear result. Presma EX series riflescopes are CNC machined from one piece of 6061-T6 aluminum and hard anodized against corrosion with a black matte finish; Sealed O-ring and Argon filled for waterproof, fogproof and shock proof performance. Featuring a high quality fully multi-coated lens, Presma EX series Riflescope forms clear, bright and sharp sight image edge to edge. This compact design makes easy maneuvering possible in real hunting and shooting activities. 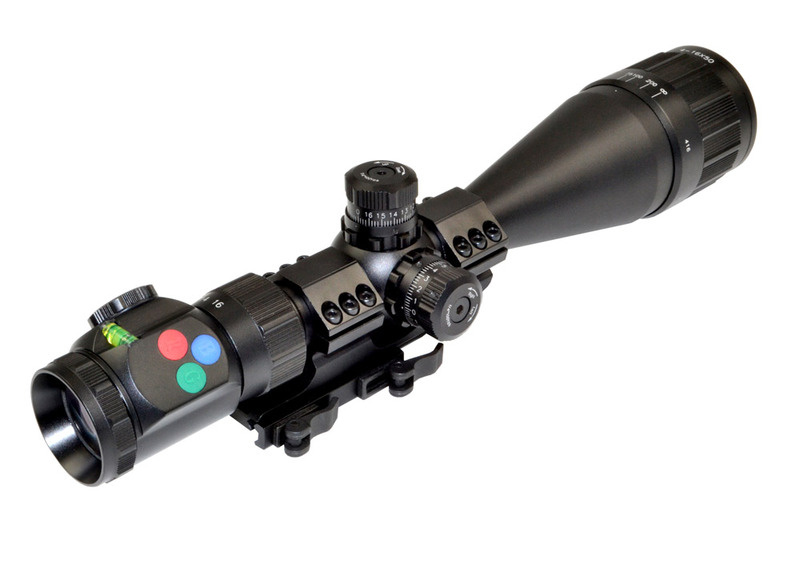 Presma® EX Professional Series 4-16X50 Precision Scope AO, RGB RXR Reticle. The Presma® EX Professional Riflescope is a versatile, variable powered riflescope equipped with tri-color electronic illuminated reticles. The easy to access and clickable color/brightness buttons are designated on a 45 degree of surface on the rear of scope. Selectable 11 brightness adjustment control lets the user adapt to different terrains and temperatures. Automated shut down power to conserve battery’s life and memorize the last reticle color and brightness position when the power is on. Mounted level bubble on the rear of tube provides tool of stability level. And comes with a bonus sunshade to block unwanted lights allowing user to see target with more clear result. Presma EX series riflescopes are CNC machined from one piece of 6061-T6 aluminum and hard anodized against corrosion with a black matte finish; Sealed O-ring and Argon filled for waterproof, fogproof and shock proof performance. This compact design makes easy maneuvering possible in real hunting and shooting activities. Featuring a high quality fully multi-coated lens, Presma® EX series Riflescope forms clear, bright and sharp sight image edge to edge. Presma® EX Professional Series 4X40 Precision Scope, RGB RXR Reticle. The Presma® EX Professional Riflescope is a versatile, variable powered riflescope equipped with tri-color electronic illuminated reticles. The easy to access and clickable color/brightness buttons are designated on a 45 degree of surface on the rear of scope. Selectable 11 brightness adjustment control lets the user adapt to different terrains and temperatures. Automated shut down power to conserve battery’s life and memorize the last reticle color and brightness position when the power is on. Mounted level bubble on the rear of tube provides tool of stability level. And comes with a bonus sunshade to block unwanted lights allowing user to see target with more clear result. Presma EX series riflescopes are CNC machined from one piece of 6061-T6 aluminum and hard anodized against corrosion with a black matte finish; Sealed O-ring and Argon filled for waterproof, fogproof and shock proof performance. This compact design makes easy maneuvering possible in real hunting and shooting activities. Featuring a high quality fully multi-coated lens, Presma® EX series Riflescope forms clear, bright and sharp sight image edge to edge. 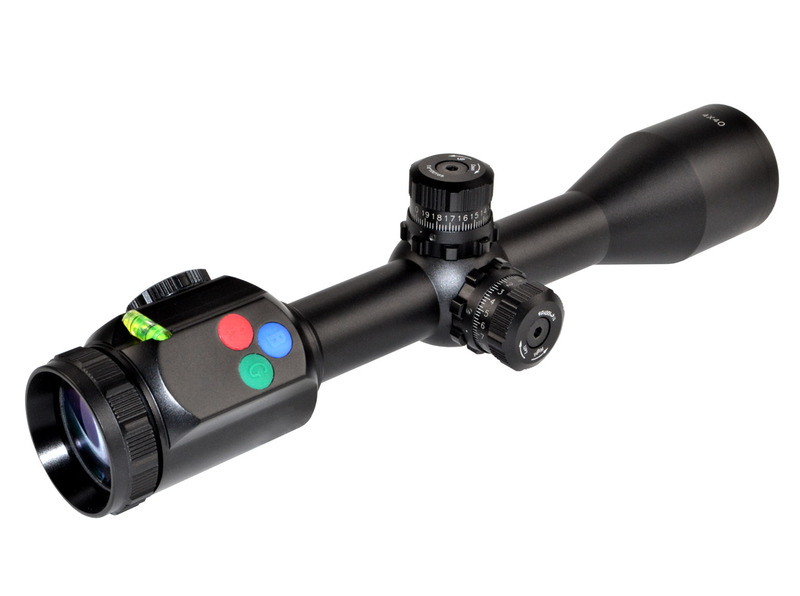 Presma® EX Professional Series 6-24X50 Precision Scope AO, RGB RXR Reticle. The Presma® EX Professional Riflescope is a versatile, variable powered riflescope equipped with tri-color electronic illuminated reticles. The easy to access and clickable color/brightness buttons are designated on a 45 degree of surface on the rear of scope. Selectable 11 brightness adjustment control lets the user adapt to different terrains and temperatures. Automated shut down power to conserve battery’s life and memorize the last reticle color and brightness position when the power is on. Mounted level bubble on the rear of tube provides tool of stability level. And comes with a bonus sunshade to block unwanted lights allowing user to see target with more clear result. Presma EX series riflescopes are CNC machined from one piece of 6061-T6 aluminum and hard anodized against corrosion with a black matte finish; Sealed O-ring and Argon filled for waterproof, fogproof and shock proof performance. This compact design makes easy maneuvering possible in real hunting and shooting activities. Featuring a high quality fully multi-coated lens, Presma® EX series Riflescope forms clear, bright and sharp sight image edge to edge.